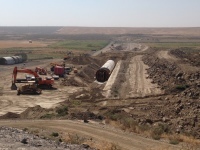 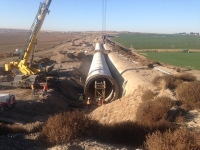 This project included the work required to add the second siphon barrels which were accommodated in the original East Low Canal construction, with the inlet and outlet structures already built; LC1 is 1,885 feet long and LC2 is 2,592 feet long. 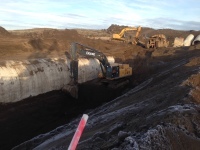 Construction of the siphons included: removal and control of water; diversion and care of Lind Coulee; clearing and grubbing; stripping; earthwork for siphon trench; construction of siphon using one of the following materials/methods: monolithic cast-in-place concrete or monolithic cast-in-place self-consolidating concrete; corrosion protection and monitoring system for concrete siphons; and reinforced cast-in-place concrete for blowoff structures. 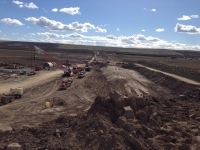 Construction also included furnishing and installing gravel surfacing; and removal, detouring, and reconstructing Lind-Warden Road.